To see a fully zoomable PDF of this poster, click here! To accompany the printed piece, I designed an application called "LP Collector." The app is intended to help users organize and keep track of their personal record collections, while also creating a personalized new way of celebrating music. For this project, I visually organized my collection of vinyl records into a complex information graphic and packaged it all in the format of a standard 12" record sleeve. The data was broken down by: year of release, song length, album length, record size, vinyl color, number of discs included, and most importantly, genre. 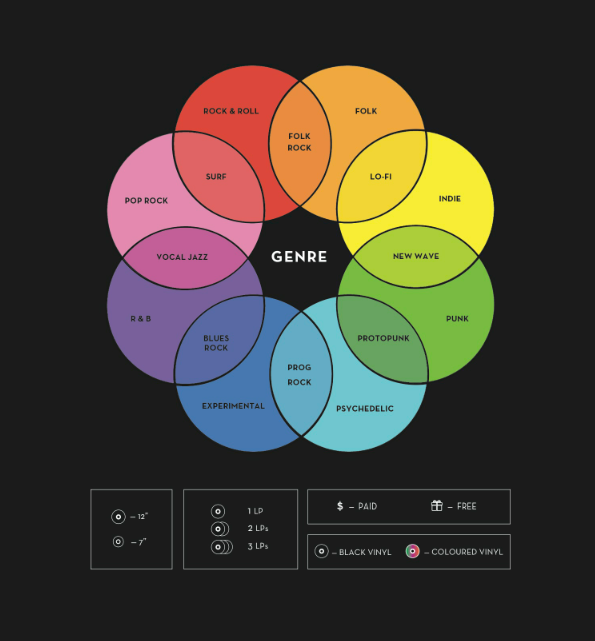 Since I chose to organize genre by color, it was important to me that the music associated with each color transitioned along the gradient in a seamless and sensible way. This way, when someone looks at the piece, they are able to get a sense of the general sound an album has, without necessarily always having to refer back to the key.